Have some fun with a sparkling new slot this week at Grande Vegas Casino with 50 free spins on the Gemtopia slot and a 25% bonus up to $100! Redeem the coupon code HM11219 to collect up your 25% match bonus and free spins by February 18th, 2019. Recent depositors can also try the new Pig Winner slot with the 50 free spins bonus code PIG-SPINS. Good luck! 50 Free Spins for New Players: Register a new Grande Vegas Casino account after clicking the banner below and claim noluckneeded.com’s exclusive 50 free spins no deposit bonus with the coupon code "NLN50FREE". 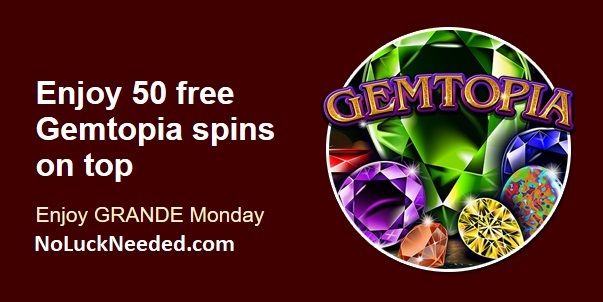 Claim your Bonus and Gemtopia Free Spins at Grande Vegas Casino!